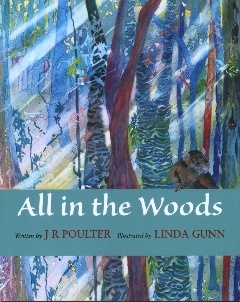 'All in the Woods' is a fabulous, fun read about a boy, his granddad, a possum and a trouble-making neighbour. Illustrated by Linda S Gunn and written by J R Poulter, it is aimed at 5-7 year old readers. I was really excited when I was asked to review this book. Generally I review YA and adult books, but I grew up babysitting and volunteering at daycares and preschools so I am no stranger to the children's book. And it's been ages since I've read a new one so I was happy to get the chance to try this one out. And it was definitely worth it. The characters are fun and the story is simple enough for a child to understand and complex enough to make them think, which I think is the most important part of a book for this age range. While this book was written for a 5-7 year old audience, I do think that younger children would enjoy it as well, although they may miss some of the plot elements. And I haven't even mentioned the illustration yet. It is perfect. The illustrations themselves could stand along as beautiful pictures but when matched with the story they are simply fantastic. This book is a great mix of illustration and story telling that every child should have the chance to read. Kathy has given one BIG thumbs up - 5 stars on Amazon and Good Reads!